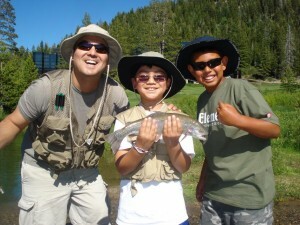 Top 10 Reasons to Book Your Summer Truckee Fly Fishing Trip Now! As we near the start of our 10th summer in Tahoe, we felt inclined to give you all a generous heads up as to why you should start planning your summer now! After what was hopefully the worst drought we’ll ever experience in Nor Cal, we can at least for now take a deep breath around the Truckee region. This list should give a very realistic, and honest update of what we’re expecting on the north shore this season from a fishing perspective. 10. 2015-16′ Was an Amazing Winter Season. 9. Our ponds will be full! Although we’ve made it through the last few summers on our ponds, water conditions at the end each summer were less than ideal. With the snow pack still left above 7,000′, we should have plenty of water in Squaw well into late summer. 8. No Fish Kills on the Truckee! 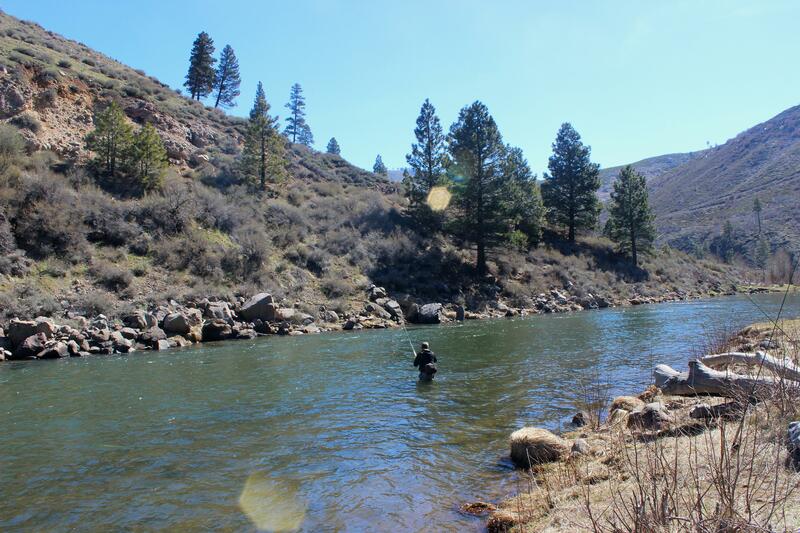 When our beloved Truckee River re-opened last fall we didn’t know what to expect. Turns out, our fish did just fine. If we did loose any fish on the CA side, it was so insignificant we haven’t yet noticed from a guiding perspective. Here is chunky, clean bow from a recent trip. As early summer approaches, that can only mean on thing…Green Drakes! No explanation needed. 6. Our Fish are Bigger, Stronger. After last summers Hoot Owl river closer was lifted, not only did we realize that our fish survived, but many thrived. Many of the fish are looking bigger, and healthier than ever! This one isn’t necessarily drought related, but it goes without saying. Year after year, our family options always seem to be at the top of our bookings. Did you know fishing is the number one activity to get kids involved in the outdoors? True story. 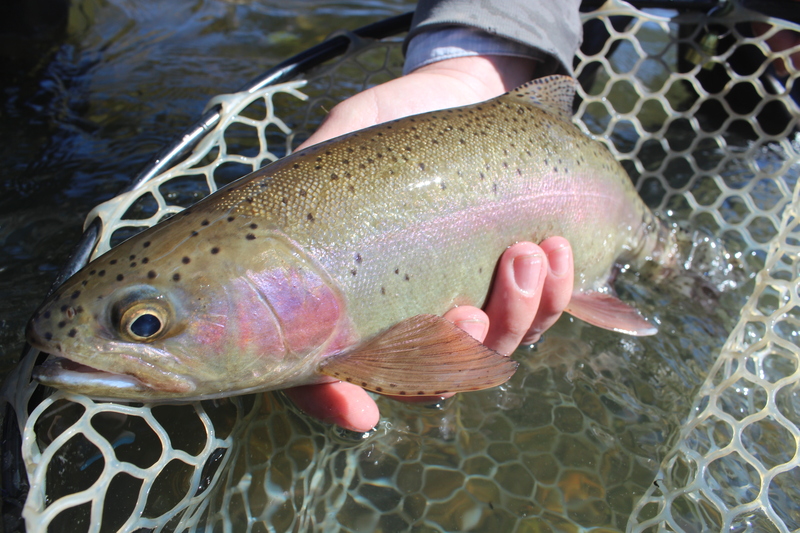 If you know the Truckee well, you know our mid-summer evening hatches can be off the charts! That said, if you’ve followed our closures the last few years, you know the Truckee hasn’t been open during summer evenings in almost three years. This will be the year to get back at it the last 45 min before dark! Caddis, stones, mays….reason enough. 3. 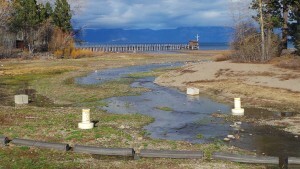 Water is Flowing out of Lake Tahoe! 2. The Truckee is Ripping! Flows from Truckee to NV have been from 400-1200 Cfs. for nearly a month now and continue to rise on the warmer days. This is the kind of run off we’ve been waiting years for. The fish are absolutely loving life and fishing will only get better as we get closer to summer. 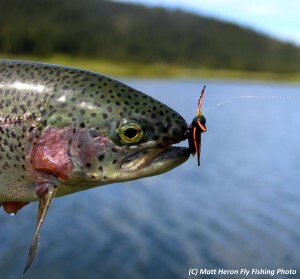 The water will drop, the water temps will rise and the bugs and fish will respond. Life. Is. Good. 1. Bookings are Exceeding Projections! 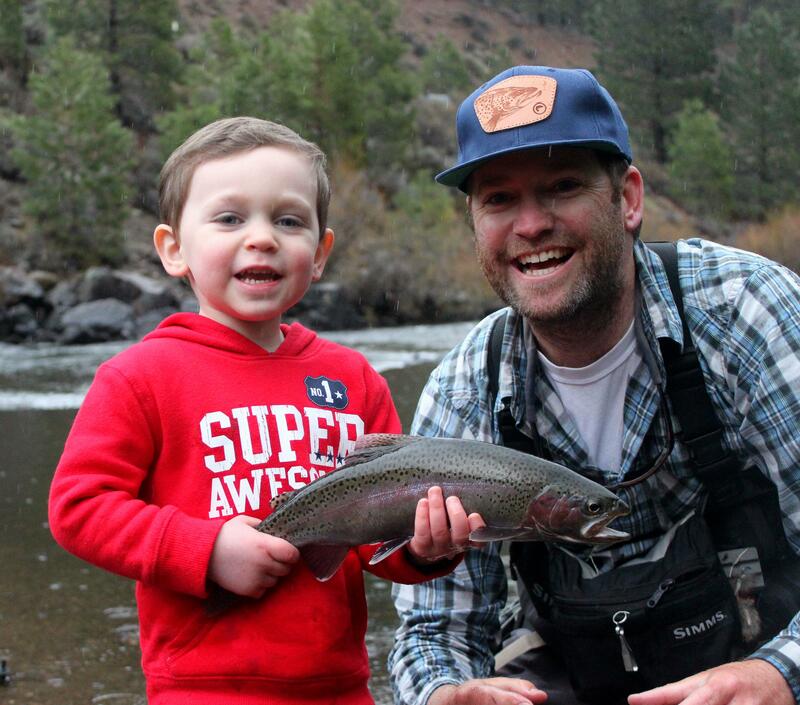 (Insert cute kid pic for sentimental reaction to help pay for his college fund) On a serious note, our pre-season bookings are way ahead of schedule with all of our guides. We would highly recommend booking sooner than later to get first dibs on the class or guide trip option of your choice! I would like to personally thank everyone who participated in the voluntary Hoot Owl closures the past few summers. Without your dedication to conserving and protecting our wild trout, there is a good chance this list could have had a whole different look to it. The Truckee continues to hover around 900-1000cfs for the second straight week in a row near Boca and in the canyon. I wouldn’t say this is unusual, but it sure doesn’t happen very often. The drop in flows has been very slow this week and that’s not a bad thing. These are the flows we’ve been waiting five years for! Now to the fishing…Although the water is high, it’s surprisingly clear and fishing has been good. 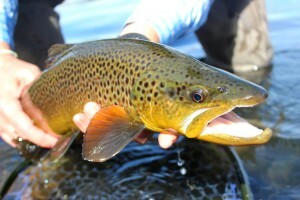 We’ve been getting into a fair share of good, quality adult fish this past week and all of our spring bugs are around. 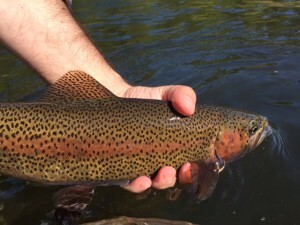 The go-to’s this week have been baetis, skwala nymphs, worms, march browns and generic dark mayflies under an indicator have been producing fish. If you’re looking to throw dries, I would throw skwala’s with a baetis emerger as your dropper. This can be a very reliable set up this time of year across the west as our first round of big stoneflies start to hatch. 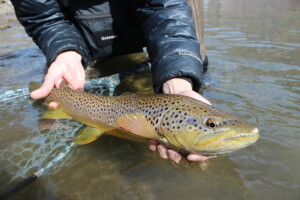 You might also try some march browns, there aren’t a lot around, but enough to give it a shot. If you’re seeing tiny sips and not many bugs, go with a good old midge. It’s hard to beat this time of year. With the river being as high as it is, try to concentrate on the softer edges and seams. The last thing the fish are doing right now is holding in fast water, wasting energy with cold water temps. The Little Truckee has been hovering around 50cfs for some time now. Not much has changed over there, small baetis, winter stones and midges have been working well. 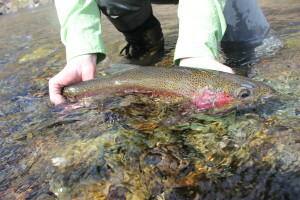 A few rainbows have started to spawn, so be careful were you walk and give them some space. Our spring bookings are looking really good this year with all the water. That said, we still have plenty of guide days open and the guys are all itching to get you on the water! A Truckee rainbow, looking good as ever. 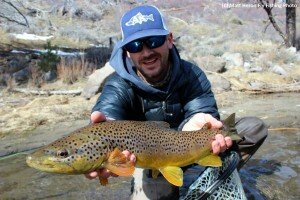 A beautiful winter brown on the Truckee. 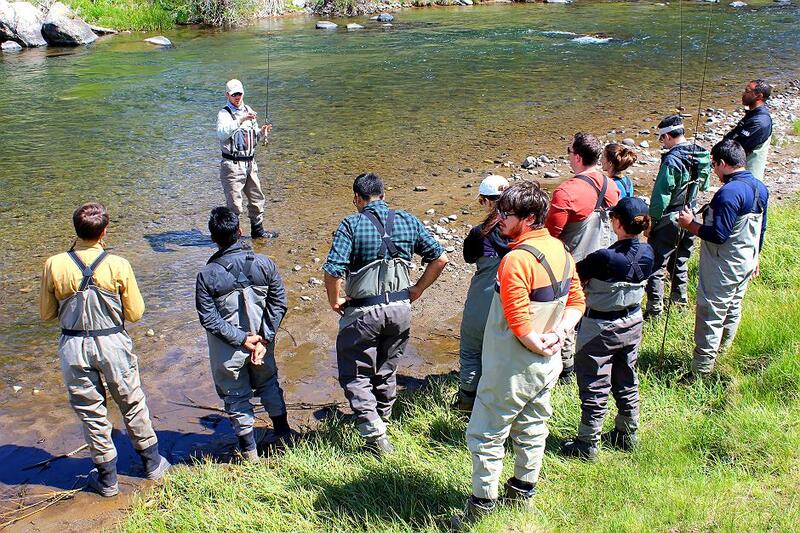 Your guide school experience will include 6 days of outside and on the water instruction. This will include a half day classroom session and a full drift boat day. We feel that being outside instead in a classroom is the best environment to learn how to be a successful guide. Also included is the opportunity for every student to spend one full day with one of our guides as a shadow in an actual guiding situation. That comes out to seven full days of guiding instruction to give you the most comprehensive guide school experience in the industry. 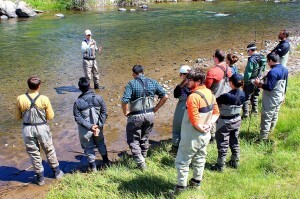 School curriculum includes: teaching fly casting with an FFF certified Master Casting Instructor, entomology and fly selection, guest services, guiding & teaching the beginner to the expert, local waters, risk management, fish and game laws, public service, marketing strategies, and many other topics designed to help you become the best fly fishing guide possible. Some big news out of the Truckee/Tahoe area this morning. 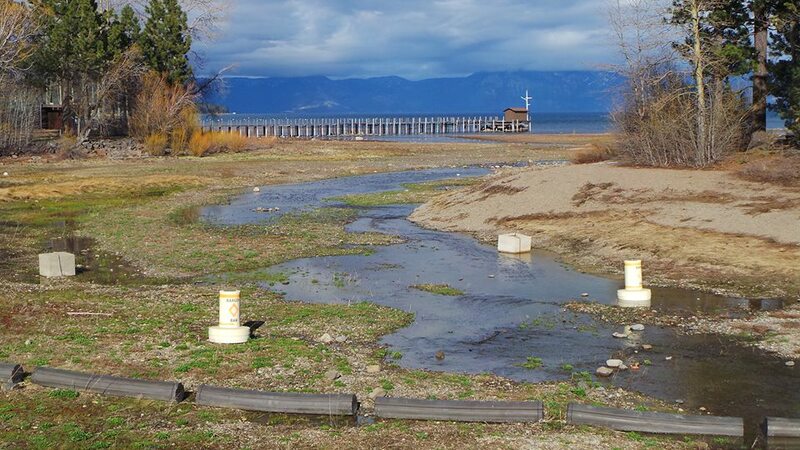 After over a year, there is finally water flowing out of Lake Tahoe again! Yes, it’s only 5 CFS but we’ll take all the help we can get. With that said, the weather has been the talk of the down lately in the fishing world. With two small storms, and one big one under out belt already things are looking up. Couple that with the big storm starting as we speak, you can’t help but get a little excited about this winter. Things have stayed pretty much the same as far as our rivers go. Flows have stayed consistent on the Little Truckee and Big Truckee (below Boca) the last few weeks. As you might imagine with the colder weather, fish are finally transitioning to slower, deeper holding water. This is especially true on the Big T.
We’ve been getting most of our fish on the usual winter bugs, small baetis nymphs, olive and dark, black winter stones, worms and every variation of small midge you can imagine. If you’re looking to try and a get a fish on top, the LT is your best bet right now. Look for any warming trends for your best chances. A really nice bow from a recent LT trip. Although we might have a few wet trips this week, we should have the rivers all to ourselves! Flows have dropped some on the Big T this week but it’s still very fishable. Keep in mind all fishing is still in the Canyon section. Like most of the fall so far, temps are really good and the bugs and fish seem to be responding. No surprise here, the main bug of the fall is baetis. We’ve been throwing variations of 16-20s, in darks and olives. Even with that being the go-to, try rubberlegs, any size caddis or worms as your attractor under an indicator. The Little Truckee is producing as it usually does this year. Flows are clear and stealth is a must. I would recommend downsizing everything, flies, tippet, indicators. 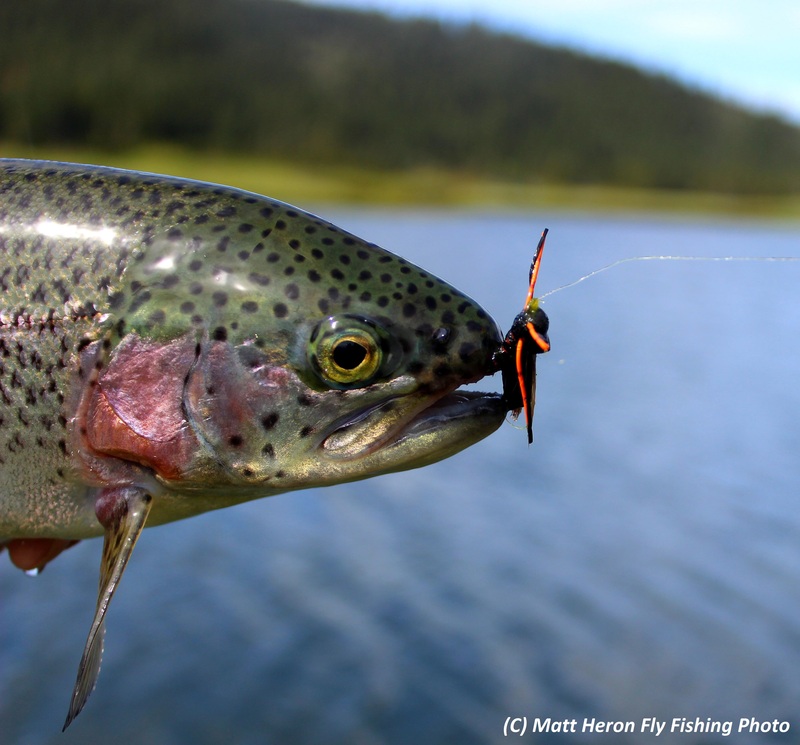 Baetis, micro caddis, and midges have been the top flies this week. Sawmill Lake (private) is still fishing well this fall. If you’re looking to sight fish some big fish in the shallows, this is the time of year to do it. We’ve also been getting into more browns than usual over there this fall. Our guides have quite a few openings still this fall. We can get singles or groups out any day. Shoot us an email or call anytime. A nice brown on a dry from this week! Possibly our biggest fish ever and fish of a lifetime! The rain last week gave the Truckee a much needed flush of fresh water through the system and the fish and bugs seemed to appreciate it. The storms did pump some color in the river from a few different sources but that’s a non issue now. We’re seeing all kinds of bugs at this point and summer hatches will be in full swing soon. There are still a few baetis around but they are pretty much ending, PMDs are out, green drakes are starting, caddis in several sizes are getting eaten daily and big stonefly attractors have been sticking fish. We had two stellar days of carpenter ant fishing that ended as quickly as it started. They aren’t done yet so make sure you have some big terrestrials with you, they will pop again as it gets warmer. Our fly fishing school ponds are still firing and we’re getting in to fish in every class. If you’re a beginner or intermediate angler, be sure to check out our extensive list of class options. Sawmill Lake (Private)- Sawmill is getting better by the day as it gets warmer in Truckee. We’re getting fish on all the normal bugs callibaetis, damsels, ants and midges. Bigger fish than normal are being caught this year and fish in the 3-6lb class are ‘almost’ the norm! 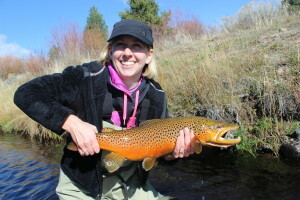 Our June is extremely full but we always have guides available to get you on the water. Contact any time at mattheronflyfishing@gmail.com or at 518-225-6587 to book. Bows in the canyon are eating the big stuff. If you were lucky enough to be on the water when the carpenter ants hatched then you should buy a lotto ticket. They went off in Squaw and on the river. Anything big and ugly worked. Green Drakes are on the move. 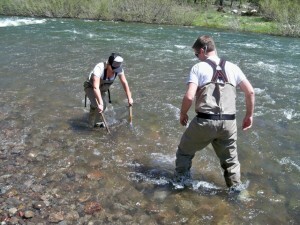 The Truckee continues to be in good shape with flows and especially water temps for the time being. Not much has changed since our last report but we’ll see if we can add a few updates. Our March Browns have been pretty good mid day if you hit it right. Some days they’re really popping and some days there are just a few around. Either way if you want to fish dries I would put on a MB attractor and a small baetis emerger behind it. That set up has been working well for us the last few weeks. As far as the nymphing game goes, it’s your normal spring bugs. If you’re chucking a sz 18 baetis and something bigger ahead of it, it’s hard to go wrong. We also have a few early season caddis around already. I’ve seen them from 20s up to 14s. There were a few giants out today. We’re happy to announce that Sawmill Lake is open for the season here in Truckee. Right now most fish seem to be in the middle of the lake holding in deeper water. As water temps start to go up over the next few weeks those fish will transition to the shallow flats where we can sight fish them. Once that happens this lake can be as fun as it gets for stillwater. 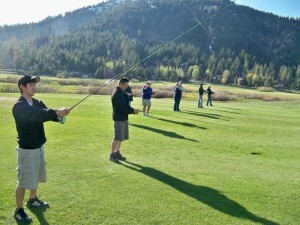 Lastly, our Fly Fishing School at Squaw Creek is finally open for the season. Our private, stocked ponds are ready to go for the season and fishing is absolutely off the charts right now. This is a great option for beginners and intermediate anglers. We have multiple class options to choose from. Spring is always a busy time of year for our team because of the perfect fishing conditions. Shoot us a call sooner than later and we’ll make sure you have a great time on the water. A couple nice bows from each of our river recently. It’s been a quite a while since our last report. We’ve had an amazingly busy spring on the river this year and the fishing has been outstanding with the best yet to come. Colder nights and cooler days have kept water temps in check for most of the last week and our fish are responding to excellent bug activity. 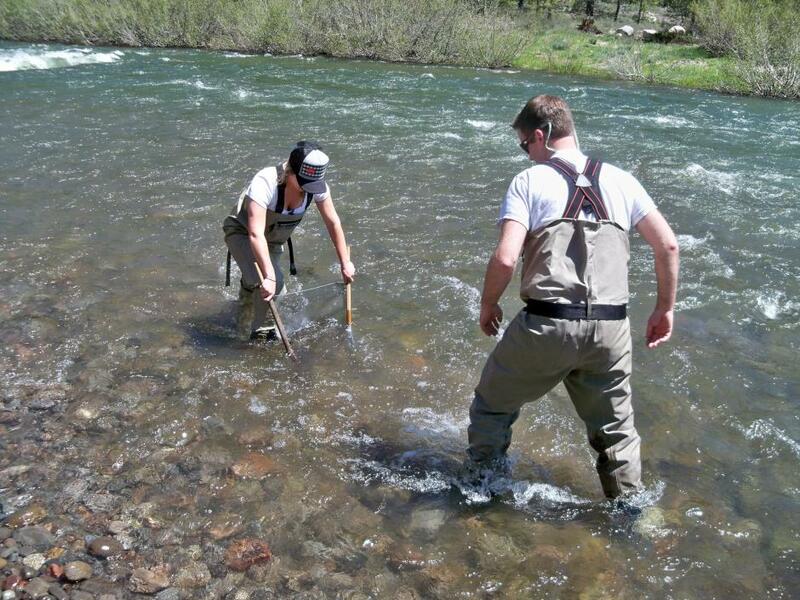 Flows coming out of Boca were finally reduced this week entering the Truckee. There are certainly pros and cons to that happening but that conversation is for another post. Either way, none of us were surprised. There are still a few skwala stones around and you might want to try fishing their nymphs as an attractor. 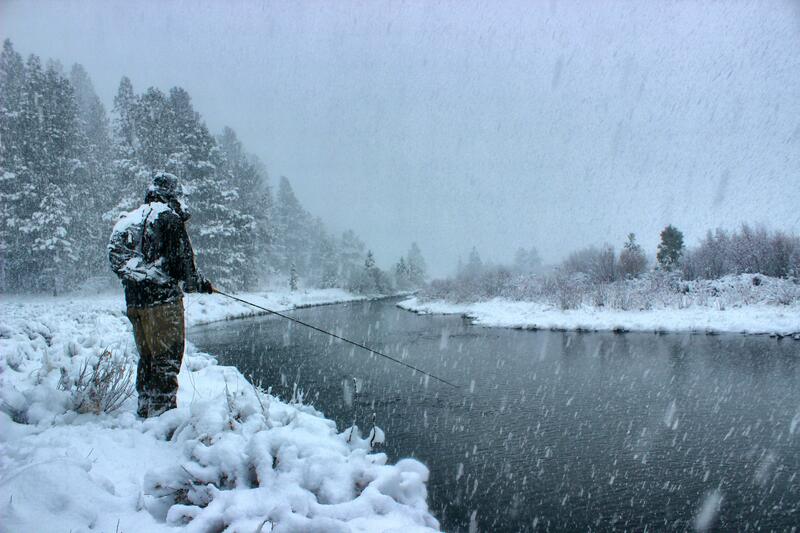 If you’re lucky enough to fish the Truckee on a cloudy/rainy/snowy day get ready for some beatis. Our blue wings have been out in full force on the crappy days and hit or miss the sunny ones. Most fish we’ve been getting into have been on sz. 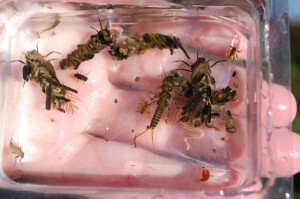 18 nymphs and emergers. March browns are around as well so keep an eye out. 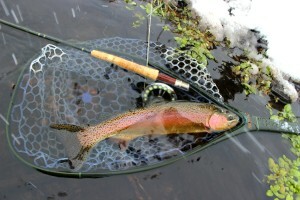 Although classic winter conditions have passed the fish are also still eating midges daily. Throw a combination of sz 18-22 larve and pupa and you should do well. Try trailing them behind something big under and indicator. Boca is dumping a bunch of water into the Truckee and has given the water that classic ‘greenish’ tint to it. These flows can be ideal for streamers. Give it a try, it’s always worth a shot. As booked as this spring has been, we’ve always got guide ready to get you on the water. Shoot us a call and fish one of the best seasons on the Truckee.